By now we’re familiar with the fact that the one-day-deservedly-famous ‘Icons in Italy’ series focuses on the very best historic players to have graced Italy’s pitches. Now, an unwritten requirement for that has always been they have to be retired for quite a few years. Is it because we look back and reminisce about the ‘good old days’ which were infinitely better than modern day football? Is it because we only realise how much we idolised our heroes after their gone? A kind of footballing equivalent of not knowing what you have until it’s gone? In the majority of cases, this is true. But, in recent years, we have come to realise that a special few players who have just retired, or are still playing, will undoubtedly have their name immortalised in the history books, and more importantly, this series. Francesco Totti, Javier Zanetti, Daniele De Rossi, Georgio Chiellini, the names roll off the tongue. Another name which slots seamlessly in our list, and has hit the headlines recently, is one Gianluigi Buffon. Many of us are familiar with the dominant Juventus side we have seen for years now, with Buffon at the heart of it. In fact, it is strange to think of a Serie A table without Juventus at the top of it. With that in mind, this isn’t a story of Juventus’ dominance which has been written about at least 64,000 times. 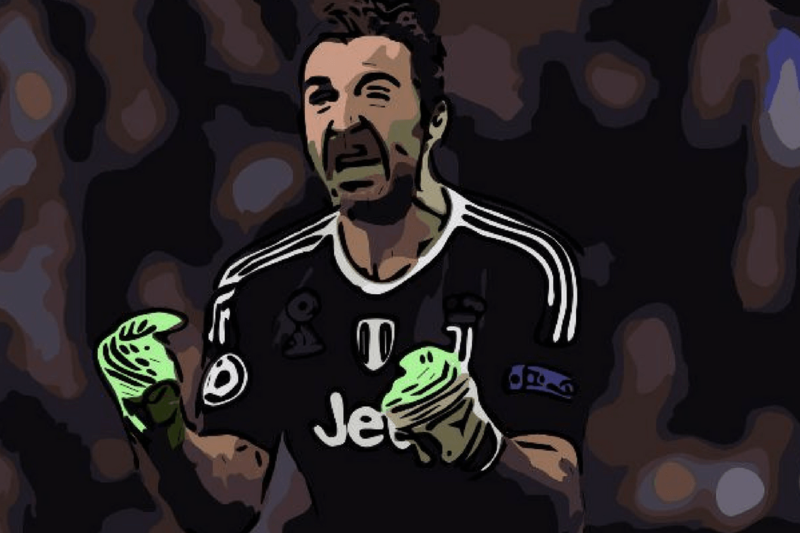 Instead, this is a story of not too long ago, a time when Juventus were nowhere to be seen in the top-flight, and a time when Gigi Buffon was not a household name. Our newest inductee has been in the news after leaving Juventus for PSG after a 23-year spell in Serie A which started at Parma. A player now synonymous with the city of Turin, Buffon was born further south in Carrara, Tuscany. Like some notable goalkeepers, such as Petr Cech, Buffon actually started as an outfield player, primarily as a midfielder for Parma’s youth team, which he joined at the age of 13. After both youth ‘keepers suffered injuries, Buffon was called to play between the sticks. Yes, the start of one of the most memorable goalkeeping careers started out after no-one else wanted to play in goal, so they stuck the tall kid in. This turned out to be a massive stroke of luck, as young Gigi put in some masterful performances. His performances were so good, that by 1995, aged 17, he was being drip-fed first-team opportunities. His first match for the senior squad would be the definition of being thrown in at the deep end. More specifically, against title-challenging AC Milan, who had a ridiculous amount of household names at the time waiting to sting Buffon’s palms, which at his age, hadn’t even stopped growing yet. It would be interesting to see the pre-match odds of a clean sheet for Parma with the likes of Roberto Baggio, Zvonomir Boban and George Weah waiting to pounce. My guess is they would certainly return a healthy amount. Yet, through a momentous performance, Buffon managed it. A 0-0 with a Milan side who would go on to comfortably win the league. Needless to say, Buffon pretty much secured the number one spot at Parma from then on. Buffon was an integral part of a golden generation of Parma players and perhaps their finest ever team. The likes of Enrico Chiesa and Juan Sebastian Veron and the prolific Hernan Crespo lead the line. Meanwhile, the youthful defence of Buffon, Fabio Cannavaro and Lillian Thuram were still learning their trade, the first steps in what would be legendary careers. Over the next five seasons, Parma never finished lower than fifth, also winning the UEFA Cup, Supercoppa Italiana and the Coppa Italia. The club’s success was crucial in building the reputation of its key players, and Buffon was no exception. He won Serie A Goalkeeper of the Year twice during his time there. Parma had managed to fight off competition for their star man almost every summer, but in 2001, an offer came in which was simply too good to refuse. €52 million was a figure beyond comprehension at the time. It was a fee scarcely believable and only maybe justifiable for the best strikers in the world who guaranteed 30 goals a season. Two points put the transfer into perspective. A year later, 26-year-old Ronaldo, having won the World Cup that summer, moves to Real Madrid for €46 million. €6 million less than Buffon. Buffon’s fee set the record for most expensive goalkeeper in the world and was only broken this week, 17 years later. Buffon wasted no time in repaying his transfer money, winning the Serie A title in his debut season, conceding an incredible 22 goals in his 34 matches. Another Serie A Goalkeeper of the Year followed, by now the trophy was a case of Cntrl C + Cntrl V and changing the year. By the summer of 2006, he had won four Serie A titles and was a certainty to be Italy’s number one at the World Cup. That was, until, the Calciopoli scandal was uncovered. Several top Italian clubs and dozens of players were accused of match-fixing and manipulating officials, with Juventus receiving the brunt of the punishment. The 2004-05 and 2005-06 league titles were stripped, Juventus were demoted to Serie B, and Buffon’s World Cup spot was suddenly in danger. Whilst admitting to placing bets before it was prohibited, Buffon denied ever placing bets on Italian matches. The case against him was weak and he was cleared of any wrongdoing the following year. However, whilst the investigation was ongoing, Buffon decided to stay at Juventus as they played in the second division, instead of joining the exodus from the club. It was arguably this moment, more so than all the league titles, which solidified his place in the hearts of Juventus fans. The spine of the team which decided to stay would be the same in years to come as Juventus came back to Serie A with a vengeance. Most importantly, Buffon kept his place in the World Cup squad. He captained the side as they dumped Germany out of their home competition in extra-time in the semi-final. The Azzurri defeated France in the final, a match famous for Zidane’s headbutt, but which should be remembered as a tale of a goalkeeper who overcame unjust criticism and relegation, to captain his side weeks later to a World Cup trophy. By the end of 2006, despite playing in Serie B, Buffon came second in the Ballon d’Or, behind Fabio Cannavaro, and won his seventh Serie A Goalkeeper of the Year. Juventus were promoted back to the top-flight straight away, but did not win another Scudetto until 2011-12. It would be a landmark title win for many reasons, including that this would be the first of SEVEN consecutive titles, an era of dominance which continues to the present day. Buffon, Andrea Barzagli, Claudio Marchisio and others who stayed during the dark days, rose up to become the foundation of one of the greatest Serie A sides in history. Like I said at the beginning, this isn’t a story of that period. To have read this far only to be told how good Juventus currently are would be, frankly, boring. This has been a story of a young ‘keeper who had a meteoric rise as a kid in the 90’s, to a fall from grace, and an even more remarkable recovery to becoming perhaps the best goalkeeper ever. That is why, more so than the ridiculous amount of titles and awards, that Gianluigi Buffon is a true Icon in Italy. Second-most appearances in Serie A (640, 7 behind Paolo Maldini).